I thought it would be instructive to compare our heating costs this winter to those of the previous owner. Theoretically, we know what he used– based on the disclosure statement when we bought the house, he claims to have burned 120 gallons of propane and 2.4 tons of wood pellets (120 50lb bags). Of course, it’s possible he was underestimating this– people tend to do that when they’re trying to sell a house– and I noticed that he didn’t mention using any electricity for heat, in spite of the fact that he had installed a plug-in electric baseboard unit in the kitchen. On the other hand, he was living here alone, and seemed like the outdoors-loving type, so it’s possible these numbers are close to accurate. The big picture is that we used about 40% of the heating energy the previous owner used, and spent only about 35% as much money. Discussion: Our electricity use for heat I’ve had to estimate a bit, since our stove, hot water, fridge, etc. also all run on electricity. But since we used virtually no electric heat from Dec. 30 onwards, it was pretty easy to compare before & after electric bills. 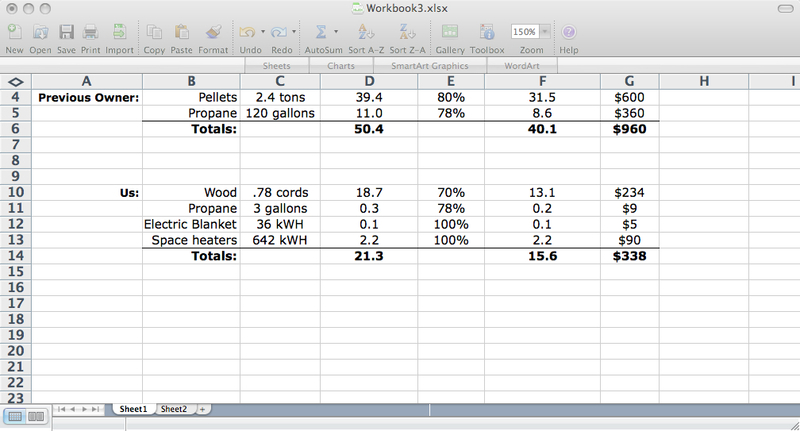 The electric blanket I just calculated from our actual use habits. The propane represents two nights where the propane heater was on in our spare room for a guest; might be less than 3 gallons. Wood burners will remark that the cost of our wood was very high; that’s because we bought kiln-dried wood this first year, which costs somewhat more than regular “seasoned” wood but is drier and more reliable. The decision is debatable. If we’d used field-seasoned wood we might’ve saved about $60, or perhaps $120 if we’d bought green wood and let it dry for a year in the yard ourselves– but these options also would’ve had a higher moisture content, so we might’ve burned more. In addition, the kiln-drying kills all the insects, so we were able to stack the wood in the cellar– so we never had to let in cold air just to fetch firewood. Our supplier tells me the kilns they use run on scrap firewood (not fossil fuels), so that was reassuring. I could go on about this topic, but I’ll refrain. Finally, about 90% of our heat came from renewable resources (a large fraction of our electric is hydro, and some is even biomass). This entry was posted on March 22, 2010 at 10:22 am and is filed under Uncategorized. You can follow any responses to this entry through the RSS 2.0 feed. You can leave a response, or trackback from your own site. Impressive numbers, though I’m surprised you didn’t adjust the data for this milder than average winter (my natural gas consumption – though not my utility bill – is down considerably from last winter, with no change in heating habits and a significant increase in the temperature I keep the hot water heater at). Never having been exposed to kiln-dried firewood, I didn’t know about its bug-free status. But a few freeloaders in my basement would not bother me.